"For a great overall effect of Health, Harmony & Well-Being"
I hope you'll find my website helpful and informative. Hi, my name is Jill, I'm a fully qualified remedial sports massage therapist & Reiki Practioner. I work full time from my dedicated treatment room in my home in Wickford, Essex. I'm self employed with full therapist insurance with Balens. I have been carrying out massage therapy treatments now for the past 11 years and I find this work to be very gratifying and rewarding. I have a passion for massage and people often remark that this is very much reflected within the treatments that they receive. I feel is it very important to have a considerate and dedicated attitude towards clients, providing the care, focus and attention that is needed for each individual persons needs. People are often very surprised at how massage can be so effective and beneficial in relieving muscular and skeletal aches & pains, especially if they had been suffering unnecessarily over a period of months or even years. Limited range of motion - example - Neck when turning from side to side. Plus many other ailments such as headaches and general aches and pains. Problems within the neck, shoulders and lower back are quite common among many people of today due to postural imbalances. I'm proud to say that I have gained a very good reputation over the years in helping people to gain better flexibility and pain free movement within the joints and muscles. I am often asked on first inquiry if I do actually use firm/deep massage pressure - the answer is YES! However, I can also adapt the pressure to suit ones level of comfort should they find the pressure too intense or painful. So please don't suffer in silence and let me know straight away. Through receiving massage on a regular basis or as part of your self care program, the evidence will be greatly noticed when you experience how beneficial this treatment can be. Consultation Form: On your first visit you will be required to fill out a Consultation form. I recommend arriving a little earlier than your scheduled booking time for all initial appointments. Additional Option: You can Download here. Please remember to bring this with you for your initial appointment. When calling to book your appointment please let me know what conditions you are experiencing (if any) such as musculo skeletal aches and pains, injuries, disorders or any discomforts so that I can devise a personal treatment plan prior to your arrival. Course of 4 Treatments: If your are suffering from chronic aches & pains or injuries, I would highly recommend having least four treatments over a period of 5 to 6 weeks so as to gain the best results. Discount Saving Offer: I offer the course of 4 treatments at a discount - (4th one half price). The whole course needs to be paid in advance to achieve the discount. This works out quite reasonable for people on a low budget. I'm all for making life a little easier... You can if you wish come along for your first initial treatment to see how you go, see if you like it, or me for that matter :) Then if you feel happy to go on to book a course of four treatments then this can be paid up front on your second visit. For exercises, latest news, topics, & information please 'Like' my Facebook Page by clicking here or on logo below. Continue to scroll down for my appointment times. Cancellation Policy: A minimum of 24 hours notice is required prior to canceling appointments. Any missed or cancelled appointments with less than 24 hours notice will incur payment in full. Parking: Outside or near my home in Mount Close or Mount Way. Genuine Enquiries Only - Please read Code of Care/Private Policy Page here. Jill is also Reiki Healer Practitioner. Reiki is a beautiful and gentle universal life force healing energy that works on all levels - spiritual, emotional, mental and physical. Helps re-balance and align the physical and emotional body. 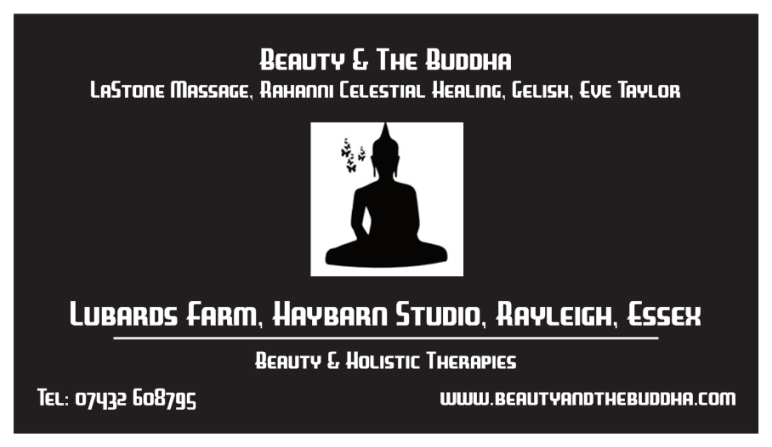 Beauty Treatments available with fully qualified therapist - Sharon Marshall at Beauty & The Buddha - Based in Rayleigh/Hullbridge at Lubards Farm. Comes highly recommended. Please mention that you found Sharon via my website. Feel free to visit and "Like" my Facebook Page for News, Exercises and Information by clicking logo below. for the gentle art for which I stand. let our energy and spirit renew. let me rest in peace if I helped only one."